Starting with the Corvette the Fast ‘N Loud crew customized for their Hot Wheels special episode. 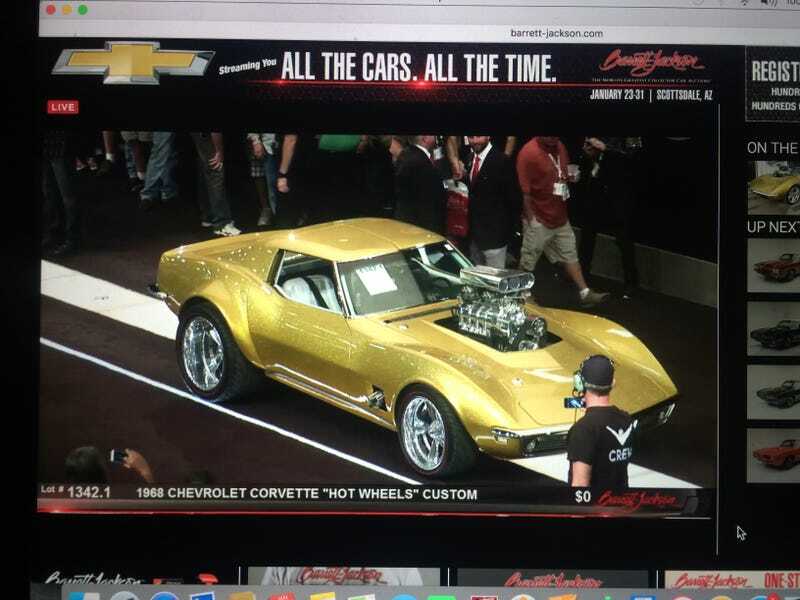 The Corvette just went across the block at Barrett Jackson and sold for $120,000. The president of Hot Wheels was also there and had the prototype version of the 1/64 car (the winning bidder received the prototype as well as the 1:1 car). The stream never showed an up close shot of the prototype unfortunately, but I’m sure some pictures will be circulating on social media soon. One of the Barrett Jackson guys said this is the first car of a Gas Monkey series for Hot Wheels, so I guess that means we’ll be seeing some more down the road. Richard Rawlings shared a picture of the prototype on Instagram. Looks like Real Riders. And man that thing sparkles.